A fantastic budget gaming chip that is just begging to be overclocked. Ah, now this takes me back. A budget-priced, low-end Intel Pentium chip with serious overclocking headroom. This is what overclocking PC hardware used to be about—not pushing the latest $1,000 CPU to see what extra few numbers you could squeeze out of a synthetic benchmark, but cooking the clocks on a cheapo chip to get your games to actually run faster. It is a bit of a shame that it's taken the celebration of 20 years of Pentiums to get Intel to relax it's iron grip on the clockspeeds of any CPU outside the K-series. The fact you can't actually buy a K-series i3 is still a bit of a disappointment to me. But forget the politics and the marketing shenanigans, this is an awesome little budget gaming CPU that's got a really good chance of wresting the budget market away from AMD's bargain FX range. 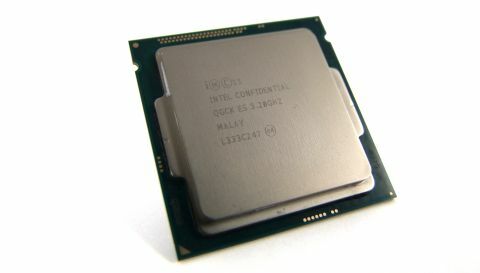 The Pentium G3258 is built from the same 22nm Haswell building blocks as the recent Devil's Canyon processors, but doesn't have the new-fangled thermal interface material or extra capacitors. That's not an issue for this wee dual-core marvel as it maintains an impressively low temperature even when you're thrashing it with a hefty clock frequency hike. At stock speeds the dual-core G3258 isn't going to win many fans—the lack of Turbo mode means that it only runs at its 3.2GHz baseclock and means the single-threaded performance is pretty weak. And because it doesn't have the luxury of HyperThreading it's restricted to just a pair of processing threads. My multi-threaded benchmark tests have the Pentium Anniversary CPU a long way behind the competition. Considering it's a third of the price of the i5 4570 at around $75 / £50 we've been recommending for the PC Gamer Rig, that's not much of a surprise. The gaming tests—mostly because of the weak single-threaded performance—also have the G3258 well behind the rest. For the most part you're looking at between 15-20% lower average frame rates compared with the i5 4570 and in the CPU-intensive Battlefield 4 the dual-core Pentium is over 40% slower. But this chip is all about overclocking, and things change around completely when you start playing with the clockspeeds. And, for the record, I'm no serious overclocker—all I've done is stick a closed-loop liquid chiller on top and thrown the CPU multiplier up in the BIOS. The awesome little G3258 has done the rest. From a starting point of 3.2GHz I was able to get the G3258 running at a completely stable, and relatively cool, 4.6GHz. That's the same top clockspeed I've been able to get from our Core i7 4770K engineering sample. Running at that top speed the gaming performance difference almost completely disappears. Suddenly the Pentium is only a few frames per second slower than the Turbo-mode quad core chip that's three times the price. Battlefield 4 is the real sticking point for this chip, and highlights how an increasingly multi-threaded gaming world is going to make things difficult for lower core count processors. Still, boosting the clocks cuts the Pentium's deficit against the i5 4570 in half. Right now Battlefield 4 is the exception rather than the rule. With the Pentium Anniversary Edition then Intel has created a bargain gaming chip that will beget some seriously powerful budget gaming rigs. Pair this £52 / $75 processor up with a £38 / $50 B85 motherboard—with that chipset's unofficial overclocking skills—and you're well on your way to building a powerful little machine at a reasonable price.